Jim Johnson, MD, MPH, is a board-certified orthopedic surgeon who is fellowship trained in sports medicine. Dr. Johnson specializes in sports injuries of the shoulder and knee. He always knew he wanted to be a doctor and with a love of sports he found orthopedic medicine to be a natural fit. Dr. Johnson completed his undergraduate education at UCLA, where he also received a Masters of Public Health in Behavioral Sciences studying the importance of the patient/doctor encounter. Through this, he learned the importance of addressing both the physical and mental aspects of a patient who is sick or injured and how doing so can better facilitate the healing process. Dr. Johnson earned his medical degree from George Washington School of Medicine, where he was the captain of both the baseball and flag football Intramural teams and helped lead them to victory four years in a row. He then went on to complete his internship and residency at Yale School of Medicine. During his time there he worked with the Yale football team and the local minor league hockey team. Following his graduation from Yale, he moved to Vail, Colorado for a fellowship in sports medicine at the Steadman Hawkins Clinic. 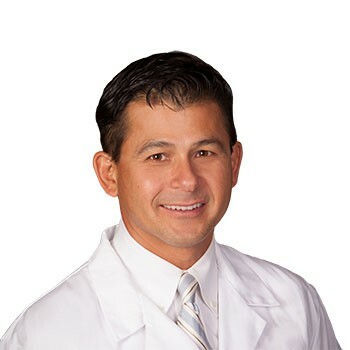 During his sports medicine fellowship he specialized in acute and chronic shoulder and knee injuries, as well as, elbow injuries and orthopedic trauma. During his fellowship he had the opportunity to provide orthopedic care for both the Colorado Rockies and the Denver Broncos. After completing his fellowship in sports medicine, Dr. Johnson joined Panorama Orthopedic and Spine Center in 2000. Here he treats, complex shoulder injuries, including rotator cuff injuries, shoulder instabilities and arthroscopic total shoulder replacements and reverse shoulder procedures. He also specializes in knee injuries – ACL repair and reconstruction, multi-ligament injuries, cartilidge restoration and patellar instability. Today, he is also a staff physician for the U.S. Ski Team. He began working with the US Men’s Alpine team in 1999 and five years ago he began working with the US Women’s Team, as well. Dr. Johnson travels with the teams to World Cup ski races where he is the on-course physician treating any ski injuries. He also travels annually to New Zealand to cover their medical needs at their training camp. “Watching someone suffer a devastating injury and come back to compete at the Olympic level is one of the most gratifying things,” says Dr. Johnson. “In orthopedic medicine you have generally healthy patients who want to get better. With hard work, time, patience and perseverance you can help them get there – back to enjoying their sport or the Colorado lifestyle. That’s what I like about practicing sports medicine,” he says. Dr. Johnson is also passionate about medical research and was President of the William Beaumont Research Society, the medical research arm at George Washington University. At Yale University he received the Yale Orthopaedic Research Award and the AOA Zimmer Traveling Resident Research Award. He also completed and published research while completing his fellowship at the Steadman Hawkins Clinic. Dr. Johnson is married and has two young girls and a Golden Retriever. When he’s not at work he enjoys running, skiing, cycling, fly fishing, baseball, golf, travel, music, cooking, camping and other outdoor activities. Benjamin Wilkerson, PA works on the Sports Medicine Team and supports Dr. Johnson.